Guided city tours to world famous Pashupatinath, Buddhanath, Swaymbhunath (Monkey Temple) and Patan Durbar Square in Kathmandu valley. Wildlife Activities in Chitwan National Park (Jungle walk, Elephant safari, canoeing, Tharu cultural show, visiting elephant breeding center, birds watching). 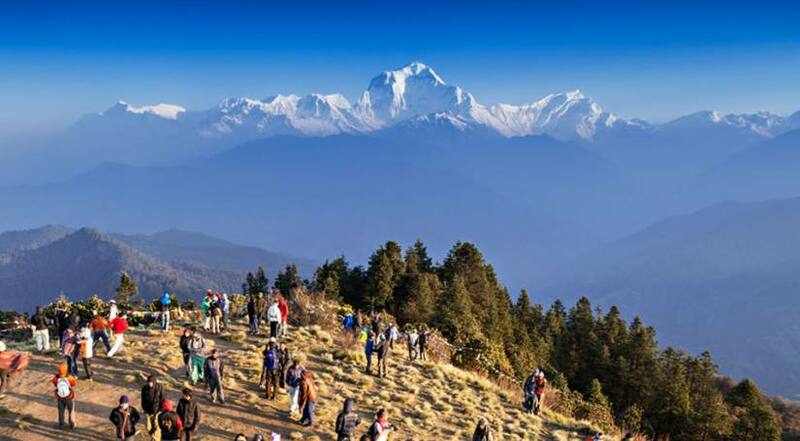 Ghorepani Poonhill Trek with Jungle Safari is a special trip which not only satisfies your eyes with the stunning beauty of nature but also excites your heart while traveling along the vibrant Himalayas. It is an easy grade trip, thus vast range of travelers can enjoy the mesmerizing beauty of the majestic Annapurna. You will also experience White Water Rafting in Trishuli River where you will have heavenly pleasure with the freshwater river and Wildlife activities in Chitwan National Park is included in this package where you can enjoy the sight of rare wild lives at their natural habitat. Also, you will have the guided tour of the three most famous cities of Nepal: Kathmandu, Pokhara and Chitwan. This trek route begins following the beautiful mountains through charming ethnic villages, rhododendron forests full of birds, freshwater rivers, stone paved ways, suspension bridges and deep sub-tropical valleys, all set below the beautiful Annapurna's. While trekking, you'll get the nice and cozy feelings at the pretty neat and well-managed family guest house. Our acent to Ponhill in early morning offers magnificent sunrise and Annapurna Massif . We also can capture some part of Dhaulagiri in a distant horizon. Ghorepani, Poonhill, Tadapani, Ghandruk are best places to visit and experience local people's culture. 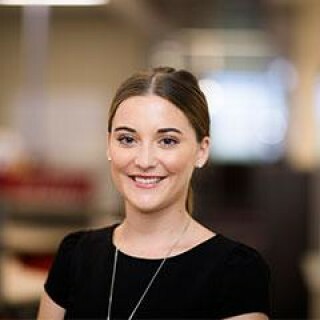 You will have your accommodation in the well-reputed 3star hotels in cities. This is one of the most famous travel packages of Nepal that includes entry level trek in Annapurna with Nepal Tour, rafting and Jungle Activities. We begin and end the trip in Pokhara. In this trip, you'll have experience of all types of accommodation in Nepal from the standard family house while trekking and the luxury 5 star accomodation in the cities. Besides, we also offer two classes of yoga and meditation: in the beginning and at the end of the trip. 03 Days Drive from Kathmandu to Charaudi for rafting. Overnight at Resort. After breakfast you will drive out of Kathmandu valley. You will reach Charaudi (2-3 hours-85 KM from Kathmandu) Rafting starting place. Do raft for 2-3 hour. Overnight at resort. After breakfast drive to Chitwan. The road snakes through verdant forest to Chitwan. On reaching Chitwan you will be greeted by the hotel representative and will hand you the full schedule of the activities that you will be doing throughout your stay in Chitwan. Then you will have lunch. Activities at Chitwan includes:Lunch followed by a tour of Tharu village and parks visitor center. Sunset view from Rapti River, dinner & cultural program. Overnight at Resort in Chitwan. Today will be filled with different types of jungle and non-jungle activities so in other words, it’s a day to have fun and to learn and observe new things. Activities in Chitwan includes:Canoeing & jungle walk or a visit to the elephant breeding center. Lunch followed by an elephant safari with evening entertainment. Overnight at Resort in Chitwan. After breakfast, leave Chitwan for Pokhara (known as The Lake City owing to a large number of lakes in the city). The road first passes through the subtropical jungles and fertile vegetation in Chitwan. As you leave Chitwan, the landscape changes. You will see hills, small settlements and terraced farms. Upon your arrival in Pokhara, the beautiful lake city, you are rewarded with magnificent views of the Himalayas, including Dhaulagiri (8,167m), Manaslu (8,156m), Machhapuchhre (6,993m), the five peaks of Annapurna and others. Check-in to the hotel and take a rest. You may also stroll in the streets of Pokhara and just enjoy being in one of the most beautiful cities of Nepal. Overnight in Pokhara. After breakfast start your trek by descending gently all the way through rhododendron, oak and other kinds of dense forests. You will hear different kinds of birds chirping on the way. This is one of the popular destinations for the bird lovers. Ghandruk is a big Gurung village. There is a handicraft center and Gurung museum. 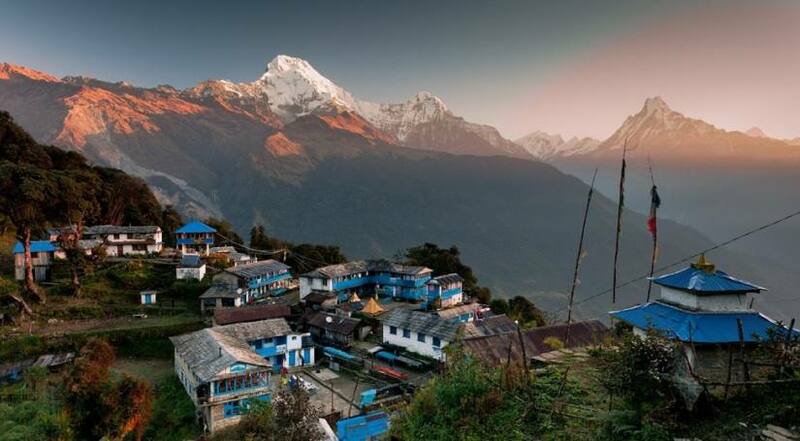 From this village you will see the views of Annapurna South, Hiunchuli, Gangapurna (7455m. ), Annapurna III (7755m.) and Fishtail. Overnight at Guesthouse. You have an option of both driving as well as flying back to Kathmandu. The Pokhara-Kathmandu flight swifts along the Himalayas unveiling Manaslu, Ganesh Himal and Langtang ranges. After returning to Kathmandu, you have the afternoon and the evening to stroll along the streets of Kathmandu for some last-minute shopping.There will be a dinner and half hour massage in the evening to celebrate the successful completion of your journey. Accommodation in Kathmandu in Five star hotel (Soltee Crowne Plaza or Gokarna Forest Resort) including breakfast as per the above itinerary on twin sharing basis. Accommodation in Pokhara in Five star category hotel (Pokhara Grande or similar) including breakfast as per the above itinerary on a twin sharing basis. Accommodation in Chitwan in Five star category hotel (Hotel Greenpark or similar) including breakfast, Lunch and Dinner as per the above itinerary on twin sharing basis. Accommodation in Rafting in standard Resort (Dalima Resort or similar category) including breakfast, Lunch and Dinner as per the above itinerary on twin sharing basis. Luxurious transportation from Kathmandu-Rafting-Chitwan- Pokhara-Kathmandu and by private vehicle Pokhara to trek starting point and ending point to Pokhara. Lunch and Dinner while you are in Kathmandu, Pokhara and trekking days (Meal costs about 4 -10 dollars per item depending on the place where you eat). We just returned from our 14 days trip. LHN are the best and we felt safe while travelling to Nepal with them and looked after us the whole time. And a big thanks to our lovely guide Bikash and our funny porters who made our trek absolutely amazing. If I have to recommend any Company for booking a trip to Nepal I would definitely look no further than LHN, they are fantastic…..
14 Day Annapurna Trek with Rafting and Chitwan Safari. Wonderful country. Wonderful people! My friend and I did the 14 days Nepal trip with Luxury Holidays Nepal and we had such a beautiful and authentic experience. We were the only two people in our group so we got our lovely guide all to ourselves. Being very inexperienced trekkers, he helped us along when we needed it and always told us what was ahead so we knew what was coming. He was able to offer so much local knowledge and his English was fantastic - he even taught us some Nepalese! We encountered some bad weather near the end of our tour and the team at LHN were happy to accommodate our wishes to stay longer at Pokhara for no additional cost. Being two women traveling alone, I always felt safe with our guide and porter and their knowledge of the landscape and the guesthouses and towns. With their knowledge, we were able to craft a holiday that was unique and meaningful. Highly recommend Krishna as a guide and the whole team at LHN were great both before and during our tour. We had a trip of 14 days with Jungle Safari and Rafting. Our guide Ram was perfect and the trek was very wonderful. Our guide was flexible and ready to answer our question anytime. He took care of us a lot and also our porters and make sure everyone is fit and fine. And also a huge thanks to Luxury Holidays Nepal!! Luxury Holidays Nepal provides you 5 star hotel in Kathmandu, 4 star hotel in Chitwan, 5 star hotel in Pokhara and standard Teahouse/Lodge throughout the journey. Teahouse and lodge have the rooms with just the basics, normally with a bed, blanket and pillows. We will provide you and your group at the lodge which is locally available every day. In Kathmandu(Hotel Gokarna Forest Resort or Similar category), in Chitwan (Hotel Green Park or similar category) and in Pokhara (Hotel Pokhara Grande or similar category). Luxury Holidays Nepal will offer you private luxury vehicle for airport transferal, sightseeing and Pokhara-Nayapul-Pokhara and Luxurious tourist bus for Kathmandu-Rafting-Chitwan-Pokhara-Kathmandu.